Public works employees were treated for nose and throat irritation after picking up something on China Road with acid in it. WINSLOW — Two public works employees needed medical treatment Wednesday after they were exposed to acid in trash they picked up on China Road as part of their weekly rounds. The workers suffered nose and throat irritation but were expected to be OK, according to Public Works Director Paul Fongemie. He would not release their names, but he said they were taken to Workplace Health at Seton Unit, MaineGeneral Health, in Waterville, as a precaution. “One is asthmatic, so we didn’t want to take a chance,” Fongemie said. David LaFountain, fire chief for both Waterville and Winslow, said the workers picked up the trash around 2 p.m. on China Road, somewhere between DR Auto Repair and the intersection of Maple Ridge Road — about a quarter-mile stretch — and when they put the trash into the truck hopper, an acid cloud burst from the truck. Fongemie said that the acid was dripping onto the road, bubbling and giving off fumes. Officials still aren’t sure exactly what the substance was. The dump truck was moved to the public works site off Halifax Street so it would be away from residential areas, LaFountain said. A police officer and public works foreman went door-to-door on China Road to try to identify whose trash it was and what the acid-based substance was. “Nobody is owning up to it,” LaFountain said. 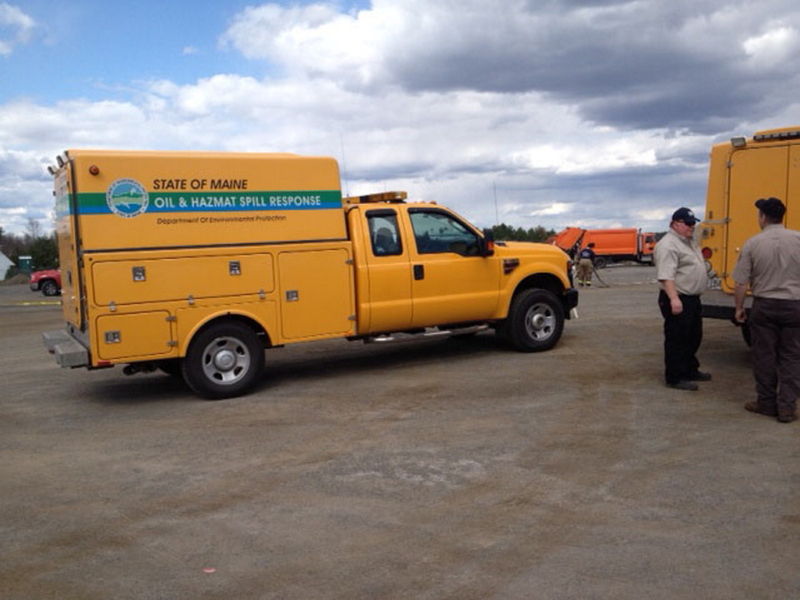 Firefighters from Waterville and Winslow, a Delta Ambulance crew and officials from the state Department of Environmental Protection’s Oil & Hazardous Spill Response team worked at the scene at public works Wednesday afternoon. LaFountain said the contaminated trash was taken out of the dump truck and put on the ground. It was to be put in the regular trash and taken to the transfer station in Oakland and officials there would be told about it, he said. The fumes from the acid had dissipated, so it was deemed safe to take the trash there, he said. Bart Newhouse and Jon Woodard, both oil and hazardous materials responders for DEP, said they tested the acid but were not able to identify exactly what it was from. “We think it was a small amount of some type of acid-based product — more than likely a household-type product,” Newhouse said. Dumping acid-based materials into trash is illegal, he and Woodard said. Towns set special dates for people to drop off household hazardous waste and they should dispose of such products then, they said. Newhouse said his department responds to such incidents about twice a year, and usually they involve unwanted, unused swimming pool chemicals. Other products people should not throw into the trash include drain cleaners, oil-based paint and a number of household cleaners such as those used to clean metal, they said. All-in-one toilet bowl cleaners also should not be put in trash, they said. They said the best thing to do is read labels on product containers, as they typically give instructions on how to dispose of them.